Finding an outdoor speaker that matches your garden or porch area can be tricky, as plastic and wires tend to clash with a natural setting. 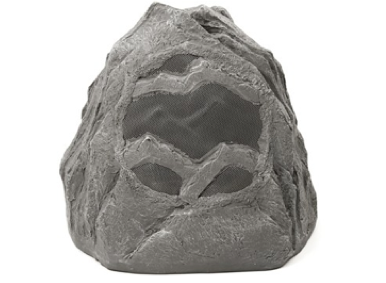 Klipsch’s AudioRock Outdoor Speaker should help with this dilemma; its realistic rocky outer shell allows it to blend in with most outdoor environments, and its wireless design means you won’t need to worry about cords or cables cluttering up your yard. The $199 wireless speaker unit is sold as an add-on to Klipsch’s $600 LightSpeaker System Architectural Speaker system, which along with providing wireless ambient sound and LED lighting for your home, also provides a 2.4 GHz wireless transmitter for Klipsch’s speakers. The AudioRock employs dual 0.75-inch polypropylene tweeters for crisp highs and a 5.25-inch injection molded polypropylene woofer for deep lows. Furthermore, the drivers are seated at a 20-degree upward angle to provide improved sound performance from ground level. The unit is weatherproof and rustproof, so you shouldn’t have a problem with leaving it out for extended periods of time, and its rechargeable lithium battery pack provides up to eight hours of playtime on a full charge; a standalone charging base recharges the battery pack in four hours.